I love to write reviews that give you guys an indefinite buy or ignore on every game I'm lucky enough to review, but sometimes a game likes to test me and make it impossible to do so. 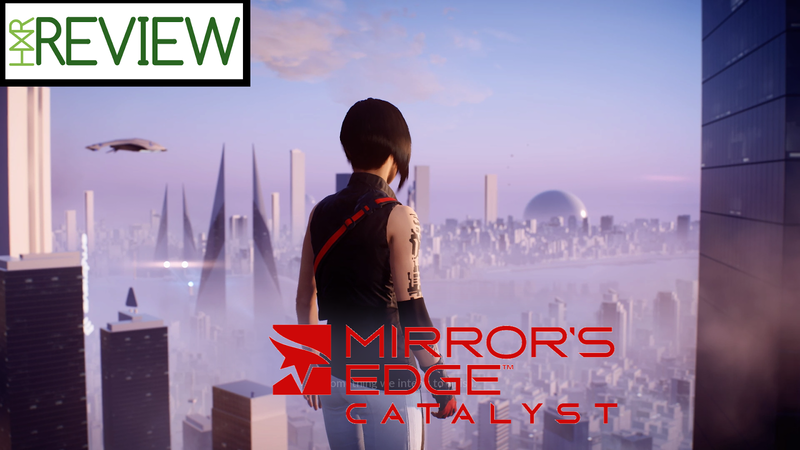 Truth be told I could have had this review of Mirror's Edge Catalyst up on the site a few days ago, but I've changed my mind on it so many times that I've been putting it off while my brain fought it out for a definite answer which never came in the end. While enjoying the previous Mirror's Edge game like I guess many of you reading this review did, I wouldn't say I got to the point of me falling in love and adoring it like many seem to do these days. Yes, I enjoyed playing the original game up until completion at the time, but asking me if I would go back now and replay through the whole game all over again just for giggles, I got to say, I don't think I could. While being a unique game when it first released, I guess the thing that stood out most for me at the time was the lead female character called Faith. At the time of the original release, there was only really Lara Croft around who did this role in video games that springs to my mind. So to see yet another strong female character taking the lead spot in what felt a very different game certainly added something extra to it at the time. Fast forward a number of years and here we are with a brand new Mirror's Edge on these powerful consoles, surely I was in for a right treat on the eyes. My mind pictured standing on rooftops and looking out at this city of glass and being blown away at what would look back at me, so it's a shame that wasn't really the case when I sat down with it for 13+ hours for this review. 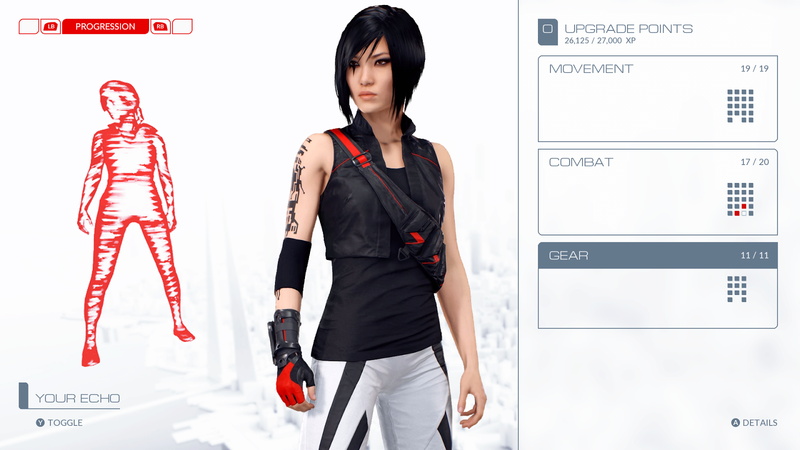 The story of Mirror's Edge Catalyst while being mostly about Faith's past and family, it also has a side helping of evil boss Gabriel Kruger, the CEO of Kruger security. I've never been a guy who likes to ruin a story for anyone looking at picking a game up, but I will say that the 15 chapters the game has while telling you this story do play out at a very slow pace. The story for me only really got good on a couple of levels that felt like I was playing the Mirror's Edge game I was hoping for. Playing as a free runner I want me some height and danger. I want to see myself leaping around rooftops and walking on dangerous ledges like Spider-Man would but without the suit. Add in characters you don't find yourself caring about that much with some of the things that take place as you go through it, and Catalyst just becomes a story that sees you going back and forth to places, either collecting something or turning things on or off for someone. Away from the story you also have the numerous side quests and collectibles to either dive into while playing through the story, or mopping up afterwards. Once again these see you going places to turn stuff on/off or even saving other runners. Do they add to the game? not really. But with these being tied down to some easy achievement points they are worth visiting if you are all about them points. The collectibles are yet another thing I had mixed feelings about while playing the game. While I don't mind the world having things like computer chips, gridleaks and so on being scattered around the world, what I found myself doing while playing through story missions was not playing them like the fast free running experience it is supposed to be, but more grinding to a standstill mid level when coming across one of these things for fear I may never come across that again. It slowed the pace of the levels right down for me, so after a while I just stopped taking any notice of them in story levels completely. You can of course replay any level any time you want after beating it, so there is that shining light.The image below covers all side quests available to you via the in-game map. Onto combat and how Faith moves, and once again we hit a few speed bumps along the way shall we say. While working well at times both the combat and movement of Faith herself can at times feel very cumbersome and clunky. In regards to combat, one would hope that the times you are faced with guards from Krugar Security it would be almost like a ballet dance, what with Faith being so flexible and fast on her feet. Sadly fights turn into nothing more than me hammering the dodge button quickly followed by hitting the light and heavy attacks buttons as quick as possible with no skill to it whatsoever. It gets even worse when harder enemies come into it, as adding guns and distance to the mix see the dodge button being used more than ever before. The movement of Faith herself hasn't really changed since last time around, but while her speed and agility is there as expected, there will be times when the game decides to hate you by not doing the right sort of jump or ignoring that wall-run you so needed to do, which in turn will see you falling to your death through no fault of your own. When it works though you do feel like a total badass, as jumping roof to roof doing skill rolls and making it look effortless if such a great feeling when pulling it off. Finally wrapping things up with the upgrade portion of the game, these are things you can unlock along the way as you rank up and earn XP. There are 3 sections to choose from, with movement, combat,and gear making up the options available to you. After putting in a decent amount of time into the game now, I have around 3 things left to unlock overall, but also now and again through the story the game will throw you a new thing to play with such as the magrope that allows you to swing over certain hooks from one side to another. Adding new toys into play also kept that slow story I was talking about earlier entertaining enough to make me want to keep playing. Buying these along the way as you play does make it feel like Faith is getting better, rather than just pointless upgrades that are just there with no purpose to them. 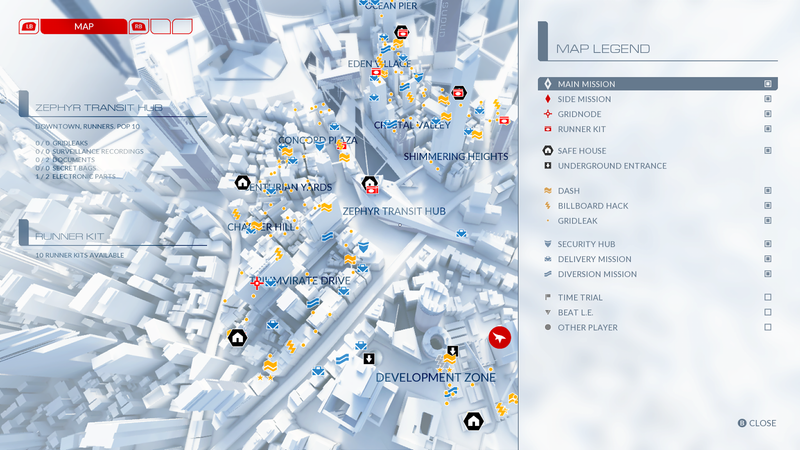 Overall: Reading back what I just typed makes Mirror's Edge Catalyst seem nothing but negative points, but the game does have good points too. While the story is slow with characters you don't really care about, something about it made me want to keep going through it away from just having to review it for the site. A few levels stand out as levels that teased me into what I was hoping the full game would be. The final level for instance without going to spoilerific gets you climbing a high building that has swings, jumps and cracking glass all over the place, so the danger bars went up and notch and playing as someone such as Faith that's what the game needed more of. I understand the whole point of telling me her backstory as such, but did people play games such as Batman to find out about his family? No, they bought a game to play a man dressed as a bat to beat the crap out of people and swoop down off rooftops and look a badass doing it. 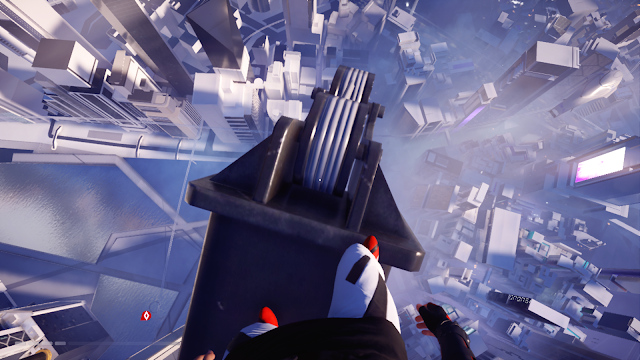 Mirror's Edge Catalyst needed to see Faith having these sort of high-risk moments too to keep the story flowing and add a little action to it, but because it never it just gets too weighed down with all the serious stuff going on. Massive thanks to the guys at EA for sending me the game to review.